I fully admit that I am accident prone and kind of clumsy. I’ve never used the mandoline that came with the salad spinner Michael’s mom got me for Christmas one year. It just seemed like a bad idea. Especially for me. But last weekend I decided that I wanted to try my hand at pickling some radishes (because I love pickled things and I recently discovered that I quite enjoy radishes so why not?). I asked Michael if he wanted to help me with the Mandoline or take me to the ER. Either way, he needed to be aware and on hand. 🙂 He said “didn’t it come with a widget?” I had no idea so we poked around and found a widget. He experimented and low and behold it was for the mandoline! YAY! 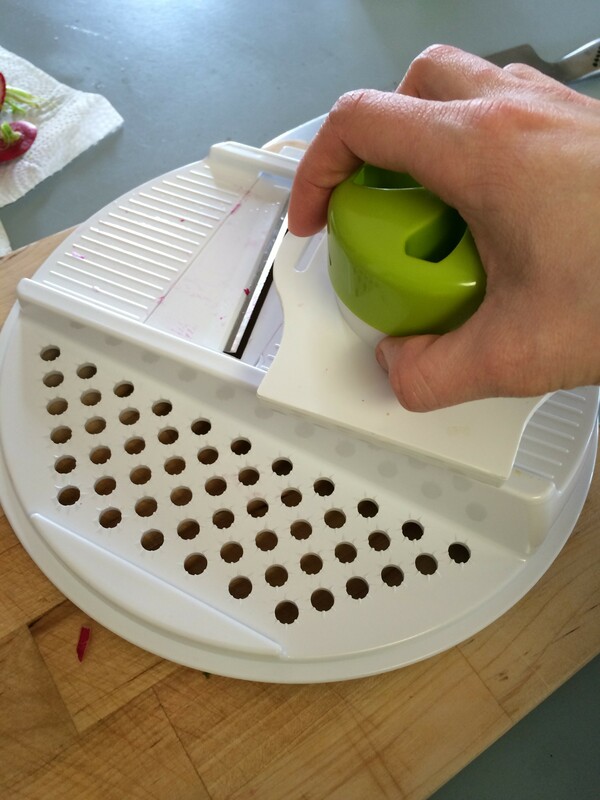 I feel excited that we discovered I CAN use the mandoline with the widget thingy and I don’t have to worry about slicing off my hand. 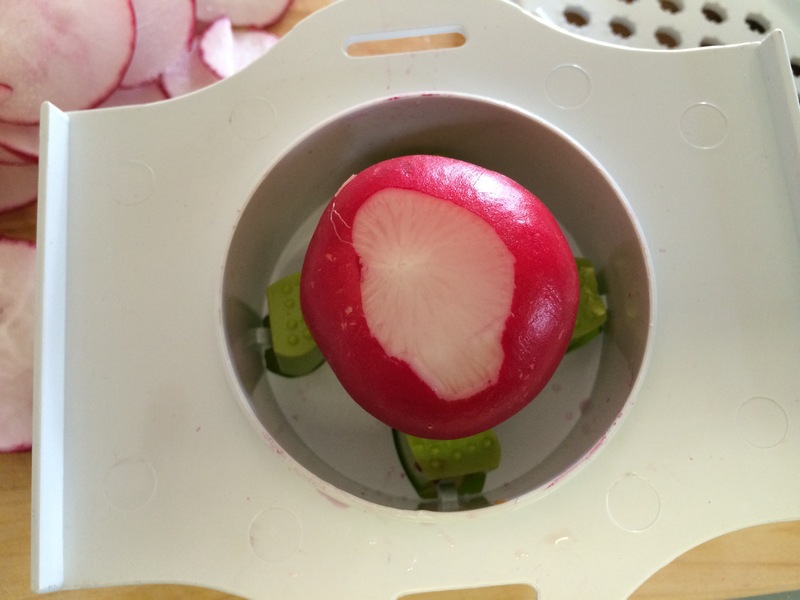 You stick the radish on the prongs and then slide it down the mandoline and your fingers are all intact afterward. Brilliant. I’ve often wondered why they didn’t come with like metal gloves or something because seriously, these babies are dangerous weapons! 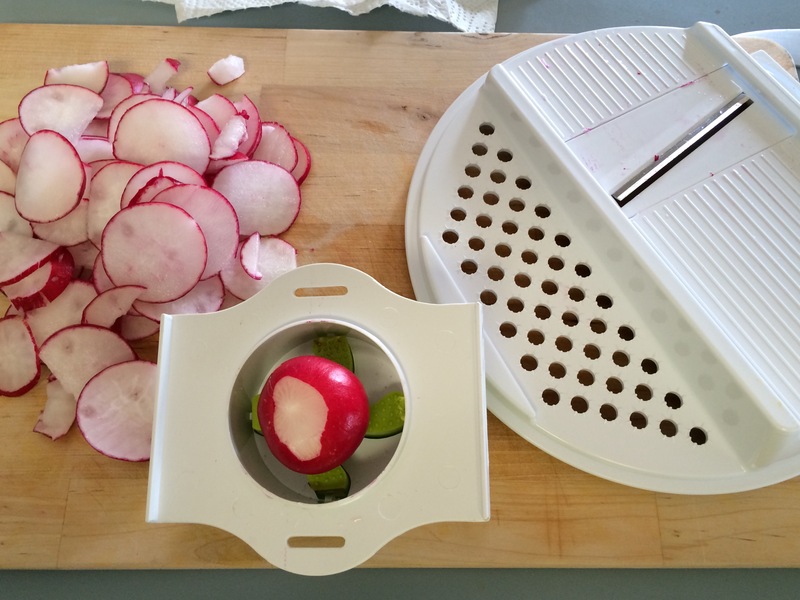 To prepare the radishes: Slice off the tops and bottoms of the radishes, then use a sharp chef's knife or mandoline to slice the radishes into very thin rounds. Pack the rounds into a pint-sized canning jar. Top the rounds with red pepper flakes and mustard seeds. To prepare the brine: In a small saucepan, combine the vinegar, water, honey or maple syrup and salt. Bring the mixture to a boil, stirring occasionally, then pour the mixture over the radishes. Let the mixture cool to room temperature. You can serve the pickles immediately or cover and refrigerate for later consumption. The pickles will keep well in the refrigerator for several weeks, although they are in their most fresh and crisp state for about 5 days after pickling. MAKE IT VEGAN: Substitute maple syrup or agave nectar for the honey. 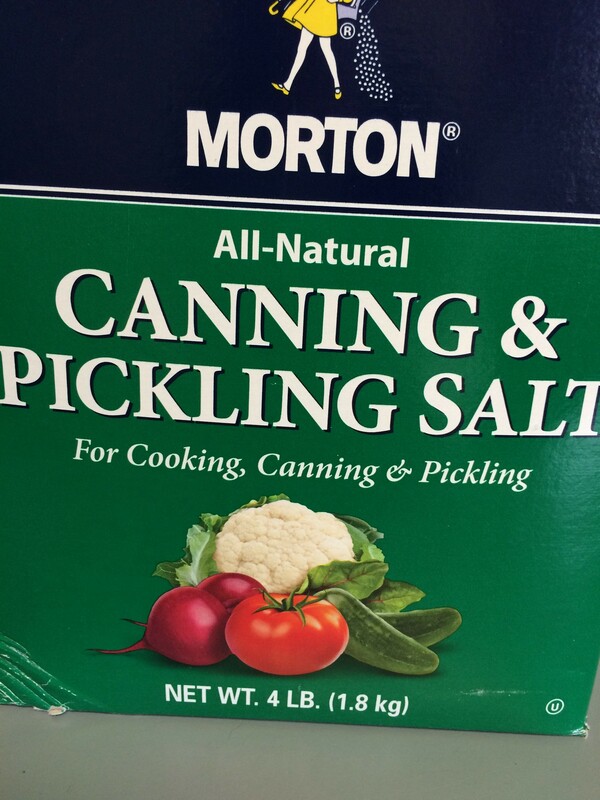 CHANGE IT UP: To the best of my knowledge, you can pickle any thinly sliced vegetables in this manner. Try carrot ribbons, cucumbers, red onions, cabbage and/or fennel! The thinner you slice the vegetables, the faster they absorb the vinegar solution and taste like pickles. 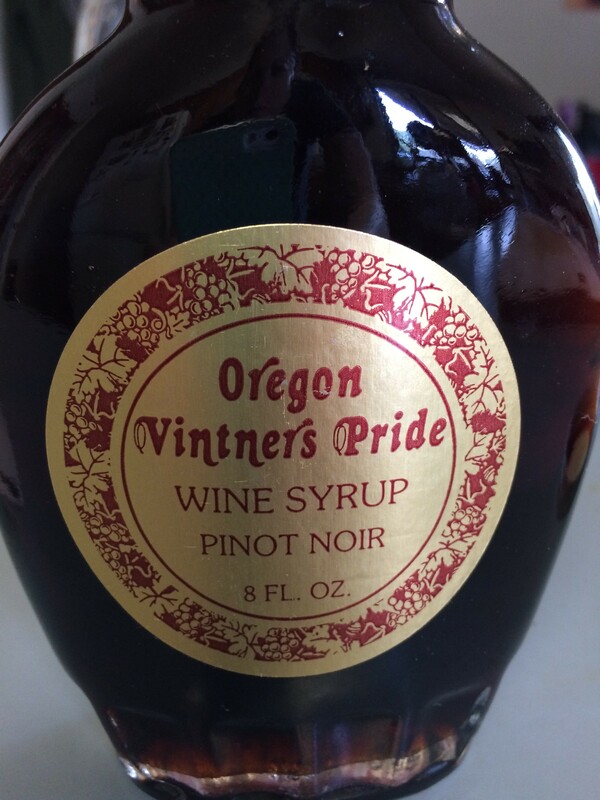 It seemed simple enough and I had everything on hand, except honey, but it said you could use syrup instead. I added the red pepper flakes and some of the peppercorns. I also sliced up about four cloves of garlic and added that to the radish mixture in the jar. I followed the instructions and boiled the water, vinegar, salt and syrup. I ran the jar under hot water then put the radishes, garlic, red pepper flakes and peppercorns inside, mixed it up a little and then poured the liquid in the jar. I mixed that up, sealed it and put it in the fridge. Unfortunately it takes a few days for the radishes to pickle and be ready to sample but I’m confident that they will be good! I waited about 6 days and then gave them a try. They were perfectly pickled! And SPICY!!! Super spicy. I loved it! I had some with dinner, which didn’t really go together but who cares. 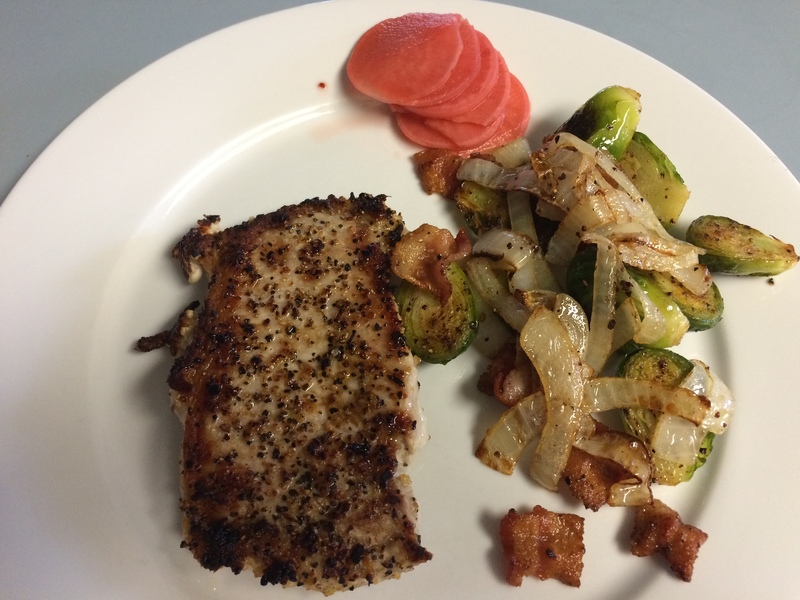 Pork chops with brussels sprouts cooked with bacon and onions, and the pickled radishes on the side. They were crisp and crunchy and like I said, very very spicy. I will probably eat this jar pretty quickly. 🙂 I need to make some more! I always forget how much I like radishes! What a great idea to pickle them. Years ago (about 17) Chris (my husband) was using a mandolin without a widget and wasn’t as lucky as you! A slice of his finger went through – it was horrible for him!! Eeeek!!!! That sounds painful and horrible!!! 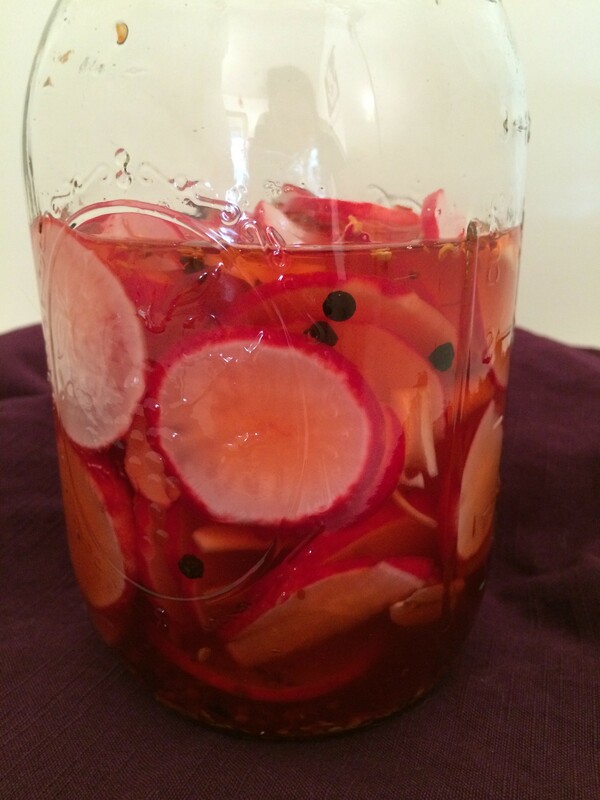 Your pickled radishes sound great. I recently had pickled green apples and was surprised at how yummy they tasted! I want to pickle cauliflower! YUM! I’ve never heard of pickled apples…! Interesting! And yes, pickled cauliflower is AMAZING. That will be my next experiment. They DO sell gloves for mandolines! I was just talking about this with friends – one has used just the widget successfully, but the other always always uses the glove from the minute he takes it out of the cabinet until it’s rinsed and put away, even though he uses the widget when slicing. I gather he had a few bloody lessons and is crazy careful now. You can find gloves easily on Amazon for about 12 bucks. It might be worth it! I will have to look. How funny! I feel the same about the mandolin. I’ve been so scared to use one. I get stressed out watching Top Chef or any cooking show where they’re just flying through veggies on the mandolin. I love watching the professionals on Top Chef do stuff like that or chop veggies…they make it look so easy! annnd now you have me confident I MIGHTCOULD use mine too!!! CARLA recently posted..Are we as sick as our secrets? 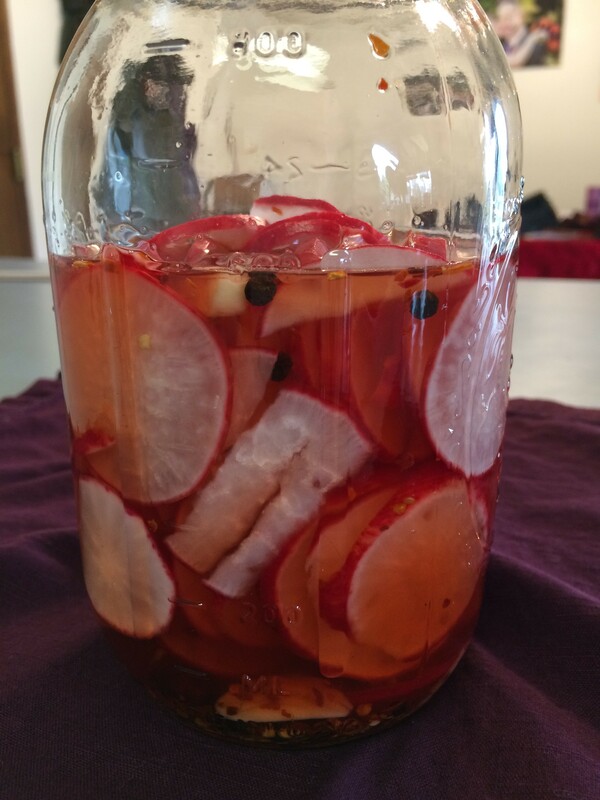 I’m going to try making pickled radishes. Those look delicious! I am a victim of the sharp blade of the mandoline so I totally understand your fear. They turned out delicious! And spicy! Deb recently posted..You Need More Yarn!